Maybe because I'm so bored with the numerous generic American mainstream horror released lately, but I seriously spotted about 100 cliches in this new poster for PARANORMAL ACTIVITY: THE GHOST DIMENSION. I mean, is that a hole in the water, in a little girl's bedroom? Hello, Poltergeist anyone? Creepy children? Check. Haunted house? Check. Unexplained yet completely predictable circumstances? Check. I really hope this is the last Paranormal Activity film. It's clearly starting to even copy itself at this point. What say you? 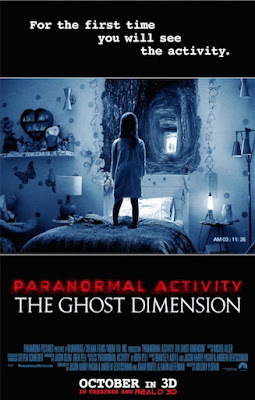 PARANORMAL ACTIVITY: THE GHOST DIMENSION is in theaters October 23. I'm hoping it's the last one as well. It's just getting exhausting.